Research into the coal depot that once existed at Cheyney Rock, Sheerness. 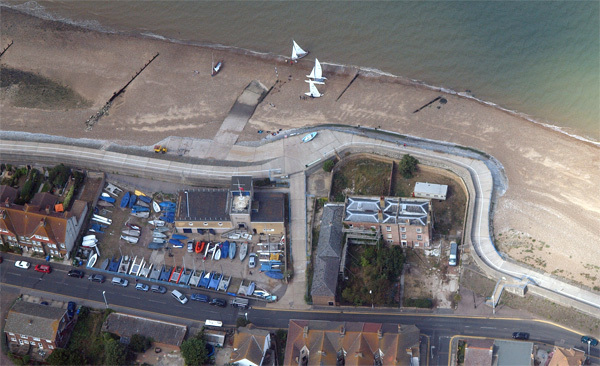 The site is now used by the Isle Of Sheppey Sailing Club (IOSSC) for its clubhouse and boat parking area. A decision to build a pier here must have been due to the excellent tidal access at this point – geographically the best of any point on the island’s north shore (and currently the site of a slipway constructed by the IOSSC in the 1960s). The slightly unusual orientation of the pier actually coincides with the prevailing south westerly wind direction (the next most prevalent being north easterly), and was undoubtedly chosen to make it easier to bring vessels alongside ‘head to wind’. From the statute, it appears the purpose of the pier was initially for removing gravel, stones, ballast & other materials from the beach. It was probably also used by boats involved with the oyster fishery business (also established by the Alston family). The origins of the coal depot are unclear, but it appears to have been setup by either William Alston, or his son David Thomas Alston. The will of D. T. Alston, dated 1 April 1857, held by the National Archives is filed as ‘Oyster and Coal Merchant of Cheyney Rock in the Island of Sheppey, Kent’. A law case from 1861 discussing the road from Sheerness to Minster also says “and that carts also came to Cheyney Rock to get coals”. 1877, Jul 1: The Sheerness Cooperative Society purchased the existing Cheyney Rock Coal Depot and pier. 1882: William England listed as Manager in Kelly’s 1882. 1882, Oct 21: Sheerness newpaper headline: ‘Co-op buys a boat “Adolphe & Laura” for coal trade 89ft. long 260 tons’. The “Adolphe and Laura” of Rye was purchased for a total of £650. Alterations were made to render this vessel more suitable for the society’s purpose, at a cost of £300 16s 1. The ship was a brigantine (a vessel with two masts, only the forward of which is square rigged). 1902: Manager of the Sheerness Co-operative Society Coal Department listed as William George. WW1: Below, the coal pier during World War One covered in barbed wire. 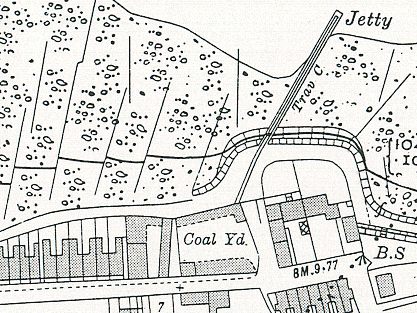 A 1933 plan of the coal yard & jetty. The jetty incorporated a travelling crane (‘Trav C’). 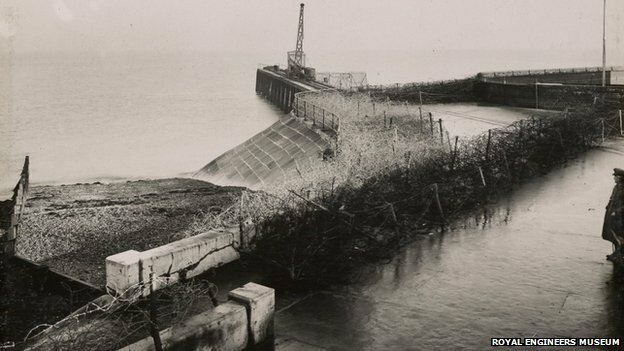 1939/40: The pier was intentionally partly destroyed to prevent enemy use in WWII. 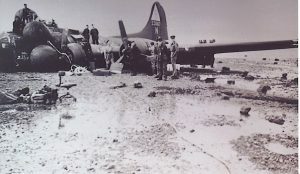 1943, May: An Am erican Flying Fortress crash landed into the sea off the coal pier. More info on this website. 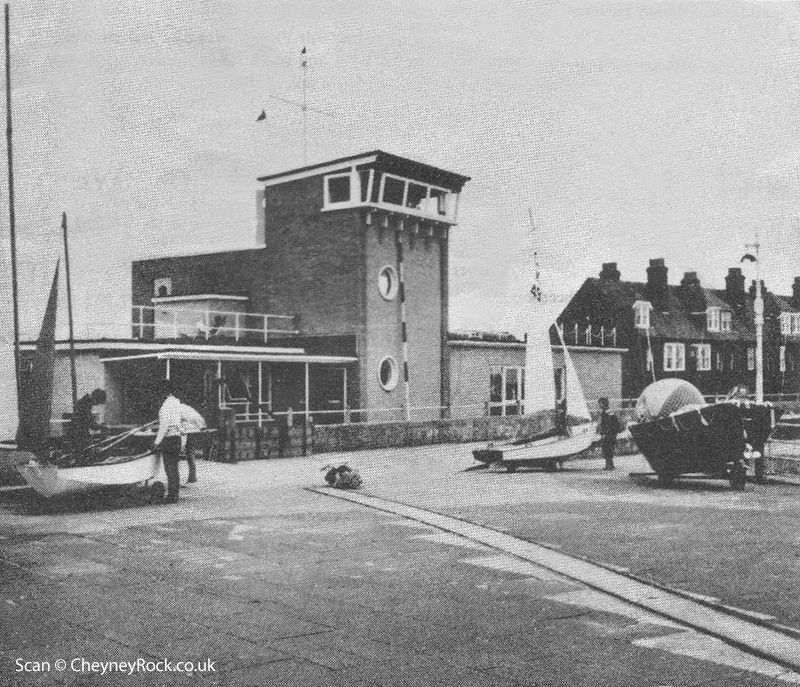 1960/70s view of the sailing club before the new seawall was constructed. The railway tracks for the travelling crane that operated out onto the coal pier can be clearly seen in the foreground. An aerial shot of the site in 2009, now occupied by the IOSSC. Cheyney House can be seen to the right. Photo (c) J. Bell. 1 Source: “Rise and Progress of the Sheerness Cooperative Society (1900)” by W. G. Tutt. Keywords: cheyney rock co-operative coal depot, sheerness, cheyney rock, cheney rock, coal depot, coal yard, coop, co-op, cooperative, pier, jetty.